This week, we're having dairy Shabbat and guests. Several are vegetarian and one is vegan. 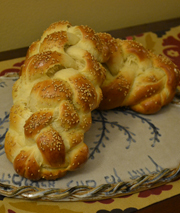 So, what better time to try out an eggless challah. I'm making one with egg and one without. Place warm water in mixing bowl. Add yeast and 1/4 tsp sugar, mixing gently. Let yeast proof for about 10 minutes. Add vegetable oil and mix with wood spoon. Add flour, sugar, and salt and beat with dough hook on a stand mixer or knead by hand. If the dough is not holding together as a ball, add a bit more oil or water. If the dough is very sticky, add more flour. Turn the ball out onto a floured work surface and punch a few times until very smooth. Place in oiled bowl and cover in plastic wrap or a towel. Allow to rise at least one hour, preferrably more, until dough has doubled in size. Punch down the ball in the bowl and remove. Punch out all air bubbles. Braid in your preferred method. Allow to rise 20-30 minutes. Eggless Wash: I just used maple syrup. I read it somewhere online, and it works really well. I totally recommend it if you run out of eggs and just need a shine. It's not too sweet at all! Enjoy! 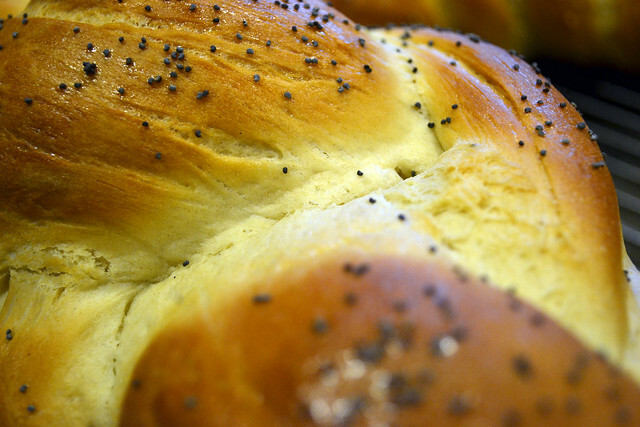 Do YOU have a preferred method for eggless challah? I'd love to hear your thoughts! This challah is a bit on the lighter, fluffier side. I make a double batch of this challah every Shabbat. It's tastes so rich, you would never think it was eggless. Yeah, we were really pleased with it! I still love my eggless challah, but I'm also really happy to have a no-eggs-in-the-house backup! This is incredible. Thank you thank you thank you! You're welcome! I was really happy with how it turned out, especially the maple syrup! @Leigh Ann, so I realized I didn't even explain the eggless wash. I just used maple syrup. I read it somewhere online, and it works really well. I totally recommend it if you run out of eggs and just need a shine. It's not too sweet at all! Thanks to you my egg-allergic son can now partake in Shabbat at his preschool. I came upon your site in my search for an egg-free recipe, and I'm happy to report that your recipe was a massive hit in our gentile household. This was my first attempt at baking any sort of bread and since Saturday, I've made 4 loaves (2 mini ones fresh out of the oven and about to be devoured). I've also tried to make the recipe a tad richer by using 3/4 cup of coconut milk. Also tried a agave & coconut milk wash to today's batch and the loaves have shiny tops. A million thanks to you again and again. @dewunderrock, thanks! Bread-making really is easy. I'm not sure why I was so afraid of it, but one of my goals is to encourage people that's it's not so hard :) How did the coconut milk turn out? I like to use maple syrup for shiny tops. Did you braid your loaf? I have an egg allergic child in my preschool class. I've always made challah with an egg substitute-currently I use a combination of baking powder, water and vinegar which works really well and had the added attraction of hissing when you add the water and especially the vinegar to the baking powder which the kids love but I'd like to try this eggless recipe. How many loaves does it make? My current one makes eight small loaves so I can send one home with each child. Would I have to double this recipe? Not problem, just need to know. If it makes two good sized loaves it would probably work for me. Thanks. how should my ball of dough feel after I have mixed it together? What texture? What weight (no exact, just feel)? Color? I really want to bake well, so any advice is amazing!!! lots of love, and HAPPY NEW YEAR! I haven't (yet) tried this recipe, but I bake my challas in the oven at 450F for 16 minutes and they come out so brown without any egg wash on top of them. I use a recipe with 4 cups of flour which includes eggs and I make 3 challas. I was looking around for a good eggless recipe since I am having a guest over who is allergic to eggs so I am going to try this one. It sounds great and people seem to love it, but I don't see the recipe anywhere ... ? Do I just use your standard challah recipe and adapt? Hi there! Yes, I would simply use my Half Batch Basic Challah method, but it helps getting this comment... this is an old recipe that I made before I did a good job about blogging the methods for every challah that I made. I'm updating the post with a method, just for you! I always follow your recipes. I will try this recipe in a couple of weeks for some vegan friends. My question is, could I bake this on thursday? Would it hold for a day? (staying fresh and yummy?). Make sure to let the challah cool completely before putting it in a plastic bag or plastic wrap. Sometimes, if I'm leaving the house I'll drape it in a clean dishcloth if it's still a little warm... then wrap it up overnight. If possible, warm them up in the oven right before serving (I usually have my oven set at 200 to keep food warm during services before we sit down to eat dinner). I think the little bit of warmth really helps especially if you have to make it on Thursday. We've been following your blog and using your recipes for a year now and love them! My daughter was just diagnosed with an egg white allergy and your blog was the first place I turned to find an egg-free challah so that she doesn't have to feel left out every Friday. Thanks! I made thisrecipe last Shabbot but with only 1/4 tsp of salt, great taste and texture, thanks!!! Is it possible to leave the NaCl completely? My vegan sister-in-low loves it!!! Can the dough be made in a bread machine? I made this the other day and it was a huge hit! My dad kept smelling it and his eyes would glaze over with nostalgia. Incredible. I have missed challah but now I can have it whenever I want! Thank you!! can i make the dough and put it in the fridge until the next day? i'm a teacher and would like to make it with the kids. is 11/4 cup water... 2 cups water??? I just did and it came out perfect - just had to check that there was enough flour while it was kneading. I ended up adding about 1/4 cup more. Can I make this in a bread machine?? I haven't made challah in years and I have a vegan friend coming for Shabbat .. I used this recipe and it was amazing! Will definitely use it again. Thanks for this recipe. Challah comes out great. I made One small addition. I hear the oil with a little bit of turmeric. The result is a beautiful golden color. Could you please let me know the recipe with the coconut milk? Also does aquafaba work with this receipe as an egg replacement? Wow, this is a winner. My daughter and her boyfriend alternate Shabbat with us and his mom. I was informed that his mom's challah is better. (I don't think she is aware there's a little competition going on between her Sephardi cooking and my Ashkenazi, vegan dinners!) 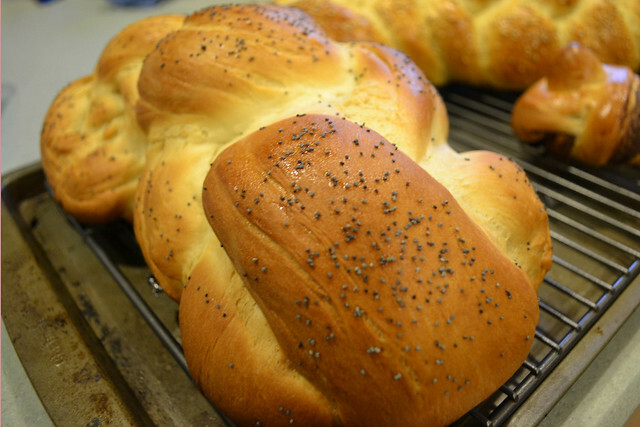 This Shabbat, they said, "OK, this is incredible, make this challah from now on." It was fluffy and delicious. Thanks!